In this post we’ll be seeing our review of the Garmin GPSMAP 64st GPS. When doing your outdoor activity, as much as possible you want to make sure that everything is smooth sailing. But in reality, there are too many things that can happen along the way. The good news is that instead of wasting time getting the information that you need for your next outdoor adventure; make things easier with the help of a GPS handheld device. Garmin is considered to be one of the top brands producing GPS handheld devices. Over the years, they have successfully launched a wide range of models like the Garmin GPSMAP 64st. So, what makes this device stand out? What are the product features and specifications? Let’s take a good look. With its worldwide basemap, you have the tools that you need when you go hiking, climbing or any outdoor adventure. The maps also include local parks, forest, national states and even other info like lakes, trails and other points of interest. The device enables you to wirelessly share your information to your loved ones. You can get your bearings with its electronic compass and you can keep an eye if there is any change in weather condition. There is no need for you to dig into your bag to read messages or emails since this device allows you to stay connected with its Bluetooth technology. You can add maps with the Garmin GPSMAP 64st. The screen is slightly smaller which is only 2.6 inches compared to other handheld GPS devices. The first time you set your eyes on the Garmin GPSMAP 64st, you can see that it has a sleek and rugged design which is simply perfect for those who enjoy outdoor adventures. What makes it different from other handheld devices is that it is a high-performance device that comes with a 2.6 inch color screen display. GPSMAP 64st showcases a 3 axis electronic compass that comes with the following: wireless connectivity, barometric altimeter and preloaded TOPO US 100K maps. It has a high-sensitive GPS as well as a GLONASS receiver sporting a quad helix antenna. This enables you to have excellent reception unlike no other. By using this handheld GPS device, you can explore the terrain and discover new places with its worldwide basemap. It has preloaded TOPO 100K maps that includes the United States as well as other regions like Puerto Rico, Hawaii and Alaska. On top of that, you also get to have a 1 year subscription of Birdseye Satellite Imagery. 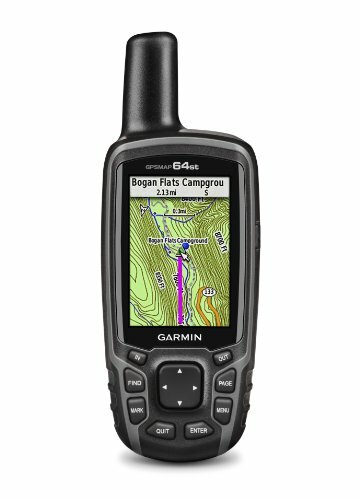 From the product description alone, there are so many things to love about the Garmin GPSMAP 64st. Now, let’s take a look with its key features. What makes it different from other handheld GPS devices? What you will like about this device is that it gives you the necessary information that you need. Whether you are into hiking or any other outdoor activity, the Garmin GPSMAP 64st can provide you with information pertaining to terrain contours, trails, elevation information, local parks and a whole lot more. Having these information and details can save you a lot of time because you have the tools you need to plan your adventure. Using this device, it enables wireless sharing. You can share your geocaches, routes, tracks and waypoints with other devices as long as they are compatible. Your loved ones and friends can also view your outdoor experience. All you have to do is to press the send button to transfer the information. What is nice with this model is that it allows you to connect to other compatible devise including accessory sensors, loot pod, VRB and heart rate monitor. When you are outdoors, things can get really unpredictable. Hence, you need to be prepared in every situation. The Garmin GPSMAP 64st comes with a 3 axis electronic compass which is a very useful feature as it can show you your heading even if let’s say you are standing. On top of that, it has a barometric altimeter that can trach pressure changes to pinpoint the altitude with precision. This allows you to know if there are changes in weather conditions. Nowadays, it is important to stay connected. The Garmin GPSMAP 64st has a Smart Notification feature. So you can receive alerts, texts and email from your mobile phone. You can still stay connected even when you are out having fun with your adventure. The Garmin GPSMAP 64st sports a high-sensitive GPS and quad helix antenna. Wherever you go, it can easily location your position with accuracy and precision. So even if you are in heavy cover or in deep canyons, you can count on this device especially when you really need it most. One great feature of this device is that apart from a built-in basemap, you can add maps giving you more detailed information as well as road maps. It has a 8GB memory card slot. Some would say that there is really no need to spend an additional sum just to have a handheld GPS device. But if you like exploring new places and if you are really into outdoor activities, this a must have tool. The Garmin GPSMAP 64st has a lot to give in terms of its product specifications and features. It gives you almost all of the necessary information that you need whether you are planning your activity or while you are already in that particular location. In terms of reliability and over-all performance, this device can deliver as expected with its superb specs. Is this product worth your purchase? With all it has to offer, it is definitely worth the penny.